Have you participated in the on-campus Hult Prize competition? Do you want to submit a proposal to the Davis Projects for Peace? Are you looking for faculty guidance on an immersive learning experience or other independent project, such as capstone or a directed study? 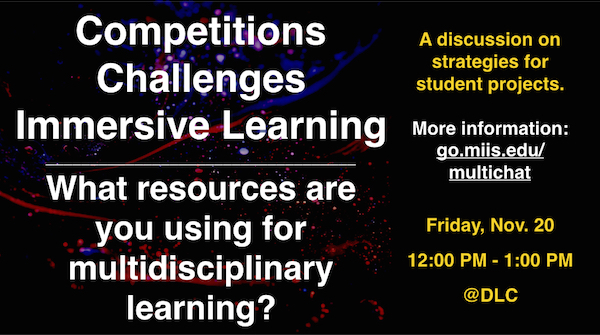 The DLC is involved in a collaborative effort between faculty, staff, and students to explore how multidisciplinary learning can be promoted on campus through campus-wide challenges, competitions, and other activities that stretch beyond classroom walls. Come share your experiences or learn from other students, and influence how MIIS prepares students to address the complex issues we encounter on and off campus.